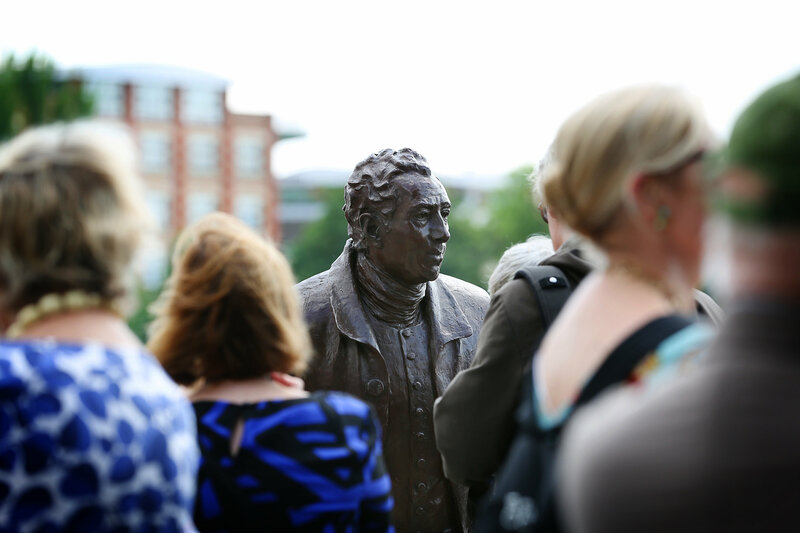 We think that at last the final piece in the assembly of the Capability Brown statue is nearly complete – the legal agreement whereby the Society gifts the statue to the Council who then formally take over the responsibility and maintenance of the statue. For reasons which we do not understand, the process has been mired in a legal bureaucracy, although there have been no disagreements about the detail. Nevertheless it will be relief when the process is completed. In the meantime, ideas for a William Morris memorial are still being discussed. This is not a Hammersmith Society project although in principle we support it, and have suggested that instead of just another life-like representative, the memorial should illustrate Morris’ many different talents and activities. 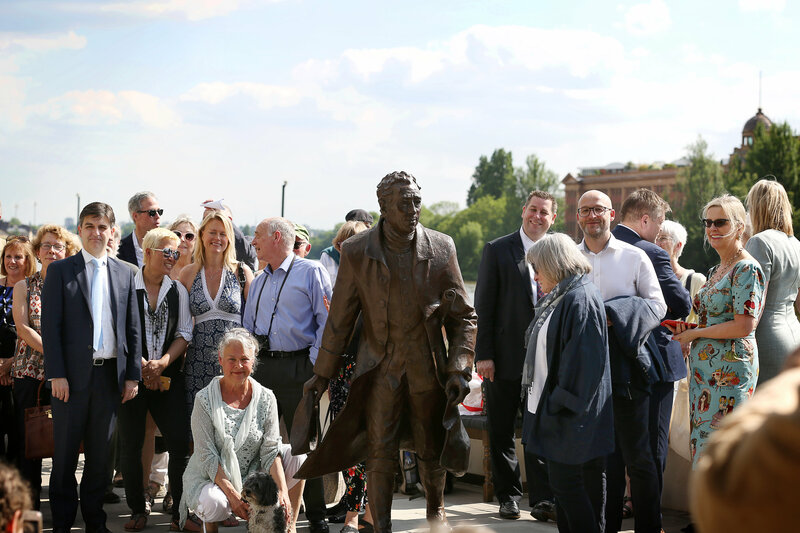 The statue was finally unveiled at a ceremony on a glorious afternoon on 24th May in front of an invited audience. Unfortunately the original Guest of Honour Sir Roy Strong was unable to attend due to ill health but the organisers were delighted that Gilly Drummond, Chairman of the Capability Brown Festival Celebrations 2016 was able to take his place, together with Cllr Michael Cartwright in his role as Mayor. Gilly is also Chairman of the English Heritage Historic Parks and Gardens Panel and President of the Association of Gardens Trusts. The Leader of the Council Stephen Cowan, MP Andy Slaughter and the sculptor Laury Dizengremel were also in attendance. Celebrations continued in the Blue Boat Pub nearby. 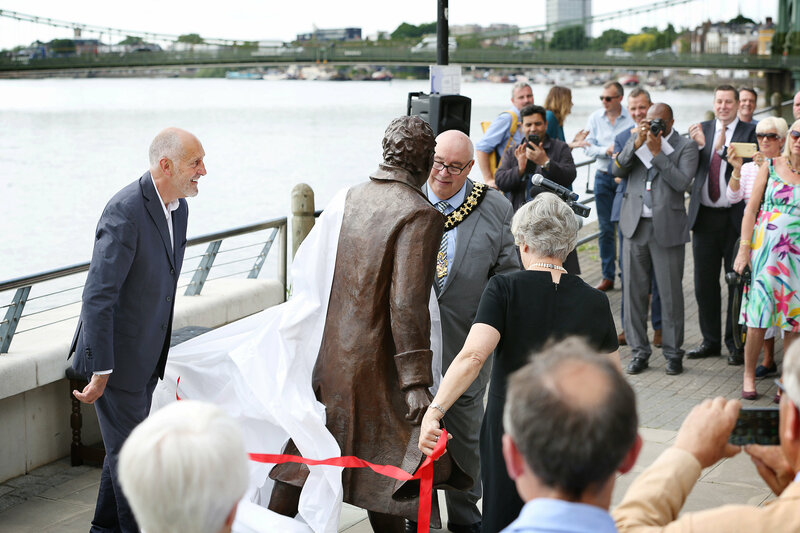 The location of the statue is on the newly adopted riverside walk at Distillery Wharf, but unfortunately the statue has been removed temporarily to rectify a slight wobble, but will be returned in about two weeks. 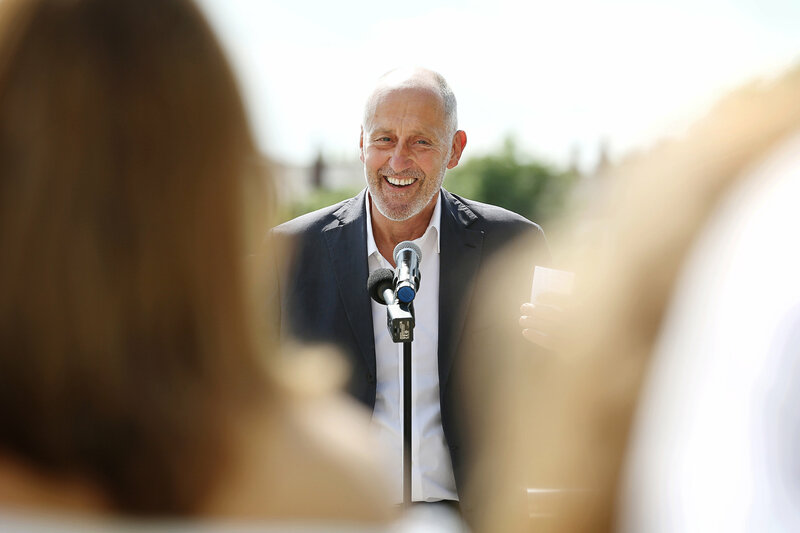 Congratulations especially to our Committee Member Richard Jackson for making the project happen, raising the necessary funds and overcoming so many obstacles along the way. Following the success of this statue, it seems that plans are now afoot for another statue to commemorate William Morris. Watch this space! Negotiations are now progressing for a possible location south of Hammersmith Bridge. In the meantime, John Goodier, Chairman of the Hammersmith and Fulham Historic Buildings Group, has advised us as follows : ‘London Landscapes no 42 Spring 2016 contains a lot of information about Brown in London. There are 42 Brown sites in London of which 27 are supported by signed plans or payment in accounts or bank records. The 27 include Peterborough House and Ranelagh House in LBHF. Ravenscourt park has evidence of Brown at 20%. There are about 30 Brown sites in the river side Boroughs Westminster to Richmond and two sites in Ealing. 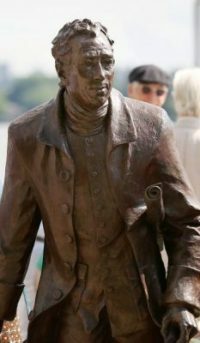 It has been said in the past that Brown did nothing locally and there was no particular reason why he lived in Hammersmith’. The other key reason why he chose to live in Hammersmith was because of the extensive tree nurseries that existed in the area. 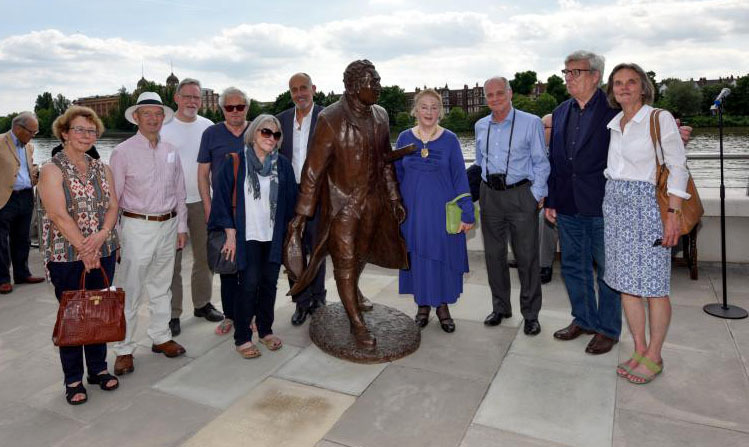 Our Committee member Richard Jackson has long been campaigning for a statue of Brown who lived on Hammersmith Mall for 13 years at the height of his career. He moved here to be near the numerous tree and plant nurseries in the area. 2016 is the 300th Anniversary of his birth. It seems others around the country are equally keen on the project. Richard writes “Following the three television programmes ‘Titchmarsh on Brown’ (More 4) which featured Hammersmith and the rediscovered drawings of an unbuilt landscape in the Belvoir Castle archive, we were contacted by Laury Dizengremel, the Artist-in-Residence at Belvoir Castle who is offering to erect a lifesize realistic statue to Brown in a public place, paid for by public subscription. This dovetails in with our proposals perfectly. It understood that several Mall sites are being considered but it seems unfortunately there is still some local opposition to the project.